Playing Jesus is never easy. Especially the bit where you try to walk on a lake. But for the people of one region in Mexico that is effectively what they can now do - walk on a lake. It is really quite easy, you just put one foot in front of the other and off you go. It is not a trick, more an illusion. 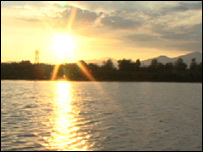 On parts of Lake Patzcuaro, 231 miles (371km) north-east of Mexico City, you can walk. Except, of course, much of the lake is no longer there. It is the lake bed that entices you out where the water once used to be. And now large chunks are gone, local people employ religious mysticism to account for its absence. "It is God's hands," says Adriana Ortega Torres. "When I was a child the water was everywhere. But just look at it now. You can now walk where it was once five metres deep. God only knows what has happened," she says. Ms Ortega Torres is the region's environment director. We walked together several hundred metres from where the waters edge used to be. All around us is a dried-out cracked lake bed. It is like a combination of a river or sea tide having gone out, only permanently. If you lean over and look at a stretch of ground up close, it resembles one of those aerial photos of the patchwork of green fields of the South Downs, with all the lines of the fences between the fields. Except on this ground, the lines are the cracks in the earth and the earth itself is brown, not green. Ms Ortega Torres has no doubts why the lake has shrunk so much. "It's because of climate change," she says. "This area used to get around 300 days of rain a year. Now we are lucky to see 100 to 150 days. So the lake cannot be replenished." It is believed that 30% of the lake has been lost in the past 20 or 30 years or so. Ms Ortega Torres says that as the water has dried up, so humans have moved in. 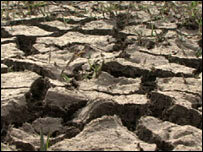 Deforestation and agriculture have added to the problem by draining and using the land. "I don't know who is to blame," she says. "Whether it is Mexican-made gas emissions doing this to our climate, or someone else, or a mixture, we simply don't know." Ms Ortega Torres is not alone in being alarmed. One recent survey found that 70% of Mexicans fear the effects of global warming. Further north, the United Nations has identified other areas of Mexico as places where the likelihood of global warming is taking effect. Certainly Mexico finds itself in a difficult position. By 2025, its expected to be using two and a half times the electricity it is using now. This is, after all, a developing country. It has a population of 105 million people which is rising - fast. It is far behind the carbon dioxide emissions of the United States. In the US they produce about 6.5 tons of carbon dioxide emissions per person per year. In Mexico 1.5 tons are produced. But population growth and economic development will likely see the Mexican numbers go up. Policies to counter greenhouse gases are not the first priority of the new government led by President Felipe Calderon. More basic stuff like law and order and poverty are the key issues. 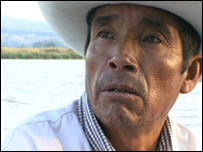 "The government could help if it wanted to," says Diego Librado Flores, a boat man on what is left of Lake Patzcuaro. For 48 years he has worked the waters, first as a fisherman and now taking tourists around its still-gorgeous reed and rushes-framed edges. "I am frightened not for myself, but for my children and grandchildren," says Mr Flores, now 60 years old. "I have heard of global warming. I don't know if that's the cause, but unless the government does something to stop the water disappearing it won't be here much longer." Mr Flores spoke his words with his face illuminated by the orange glow of a late evening sunset, the suns rays casting a path of splintered light across the surface to our boat. The loss of such an exquisitely beautiful place would be the equivalent of an ecological elbow in the ribs. Proving global warming is the culprit is hard. But here in Patzcuaro, the doubts are as rare as the fast disappearing water itself. They believe it is human-driven activity that is sucking the life force out of their cherished lake. They may now be able to walk on parts of it, but what they really want is a miracle to save it.